Merseyside Police will take no action against Manchester City midfielder Joey Barton for baring his backside at Everton fans. Barton dropped his shorts after City scored an injury-time equaliser in the 1-1 draw at Goodison Park on Saturday. "Merseyside Police has been in consultation with the Football Association in relation to the Barton incident," said a police statement. "The FA will now continue with its own investigation," the statement added. The FA has already received referee Andre Marriner's report of the incident. 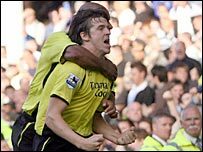 Barton, 24, handed his shirt to a young disabled fan after the final whistle but then seemingly reacted to taunts from Everton fans after Micah Richards' late strike. He was smiling as he dropped his shorts but the incident took some of the gloss off a hard-earned point for City, ending a run of 10 defeats in their last 11 away games. TV pictures captured the incident and police spoke to City manager Stuart Pearce abut it. "I did not see it but if anything did happen, we will look at it with an open mind and deal with it," said the City manager. "The police approached me afterwards to make me aware of what had happened. "I am sure the timing of our goal had a lot to do with any over-celebration. "Maybe also there was the fact that one or two people have been saying things about our away form." Everton fans reacted angrily before City keeper Nicky Weaver intervened. Merseysider Barton has been involved in previous incidents with Everton fans, having had an altercation with a Toffees supporter in Thailand during a pre-season tour in summer 2005, which led to him being sent back to England.